It is our third visit to the restaurant, our favourite in Caiscais. It is a small restaurant where the food is delicious and the atmosphere great. 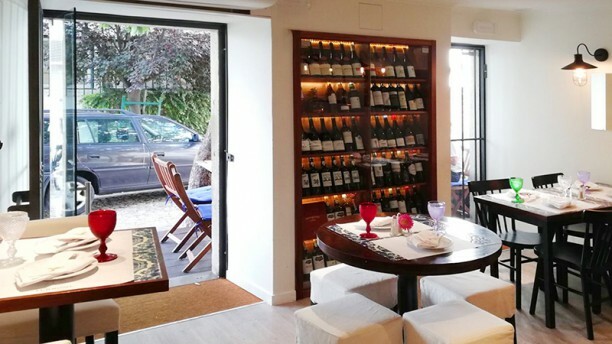 The owner is very knowledgeable about wine and has been recommending great wines to try. The service is friendly. The restaurant was lovely and cosy. The waiter was extremely knowledgeable about wine and made us feel welcome. We plan to return. Great place. The food is delicious, I tried the pork and on another occasion the sea bass. Both times, it was excellent. The owner and his wife a very friendly and we got great recommendation for our choice of wine. The service is attentive and friendly. Fantastic! The delicious dishes and the wine pairing recommendations were perfect. Absolutely lovely and amazing ???????? Everything about the meal was excellent. Small but very comfortable space runned by the owners. Good food . Good wine. Good service. A place to return. A fantastic restaurant, with superb service. So knowledgeable about the wine and so much choice! Food was great but service was a little slow. Very nice meal, nice surroundings, very nice staff. What more could you want? Got a waiter that had quite some low service level. We tried to order an apperitif before our dinner, and he looked at us as we were the stupidest guests ever pointing at their wine bar....yes I understsnd that this is a wine bar, but shouldn’t exclude good apperitif if you also offer dining. If so, you could at least tell me with a smile on your face. Overall, he was bad at takin out plates and glasses when they were empty so we ended up with a lot of empty plates on our table... Also asking for fitting wines to our dishes, we never got to know what kind of wine we received apart from ”red” or ”white”. This lowered the feeling of being on a professional wine bar. The food was good, but we had higher expectations of the place when it comes to service which resulted in disappointment of our visit.